← Master of Kung Fu Returns! Posted on October 7, 2015, in The Dollar Box and tagged Bernie Wrightson, DC Comics, Len Wein, Swamp Thing. Bookmark the permalink. 10 Comments. It’s amazing how well the early Swamp Thing stuff still stands up. The Alan Moore/Bissette/Totleben run gets most of the attention, but the Wein/Wrightson stuff is just as good in its own way. Same with the Rick Veitch as writer stuff that follows Moore’s run. 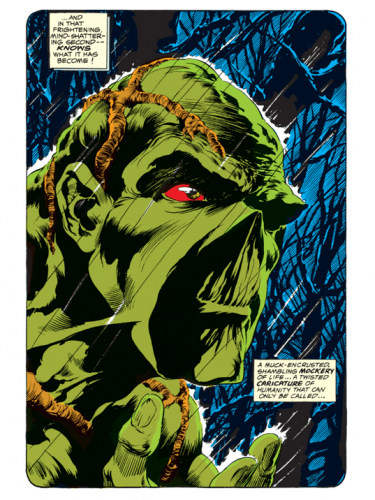 I first came to Swamp Thing during Alan Moore’s run (which might remain my favorite comic run of all time). It was only years later that I went back to the originals and came to love them, as well. I thought Nestor Redondo’s art was pretty phenomenal, and Tom Yeates did a great job on the art too with Martin Pasko writing. Those issues had some ups and downs in story, but I was always captivated by the detailed artwork those guys brought to every issue. 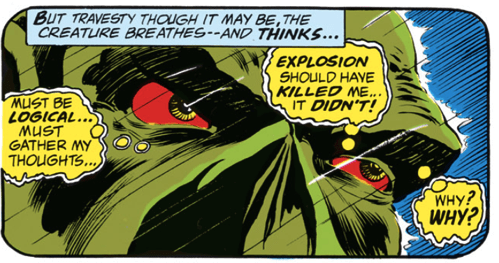 And there were more than a few moments of horror, which is not easy in a format like comics. I wonder how much Moore et al were inspired by their predecessors. 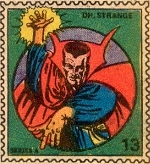 It seems to me that Alan Moore paid close attention to continuity … before going off in a direction no one would expect. His “Anatomy Lesson” remains the greatest reinvention I’ve found in comics. 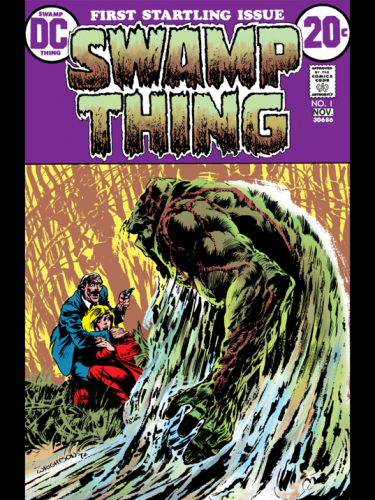 It preserves the core of Swamp Thing, honors the past of the character, and opens up entirely new dimensions for the book. 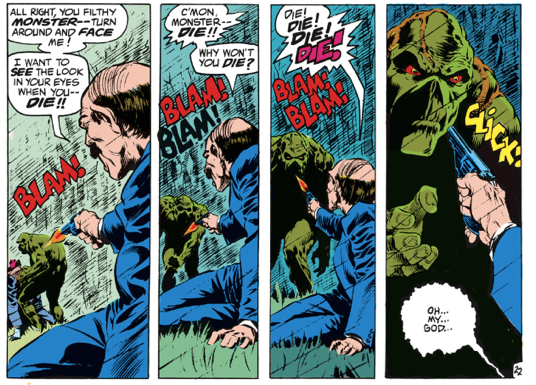 Berni Wrightson left Swamp Thing at exactly the right time. Totally agree with everything you say about his work on the series, Paul, but I’d add that quitting while he was ahead – before hitting monster of the month territory – was a part of what gave his work such impact. The “long and short of it” indeed. Agree with Anonymous about the amazing Nestor Redondo, but the limitations of the original ST concept were already working against him. Its easy to forget how innovative Moore’s early stories actually were, and how much they opened the series up. 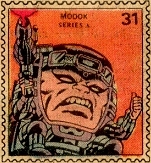 It took a crazy outsider like Moore to see something new in this character, but he had a genius for reinvention. I’ve never cared much for his original characters, but his pastiches and (especially) his brief time offering new takes on DC characters are generally very special. It’s a real shame Moore & DC went splits — there are dozens of characters in the DC stable that I’d love to see Moore take on. But I wonder if it was ever really on the cards even if Moore had stayed at DC, Paul – his reinventions really put characters through the mangle and use them up, which doesn’t sit easily with an ongoing continuity. 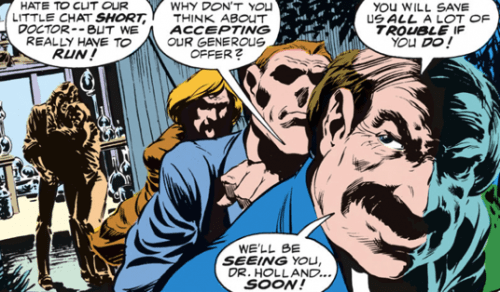 After all, DC vetoed use of the Charlton characters and balked at the Twilight proposal. Mind you, I think Moore works better with less restriction anyway (I have a hard time imagining a Charlton series being quite as great as Watchmen) and love the later stuff too, so we have a difference of opinion there. 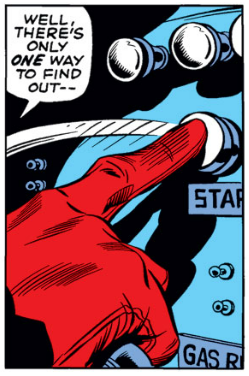 But we could probably agree about wishing for more of his take on Marvel? People forget he worked for them first (sort of). Back in the Captain Britain days, apparently he was mad keen to work on the FF. Moore’s work often felt apocalyptic, like every book he wrote was the last book ever written … but he could color inside the lines, too. 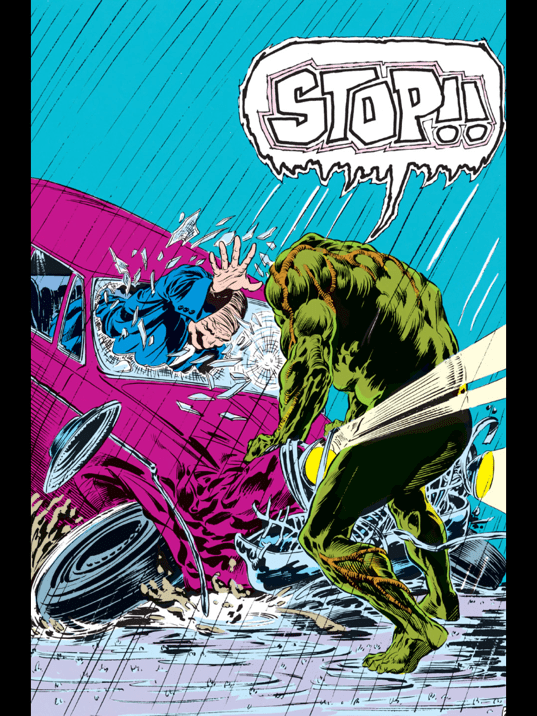 His Swamp Thing run turned everything inside-out, but it ends with Swampy and Abigale walking into the sunset, all nicely set up for the next creator to go whatever direction they wished. I have to think continuity issues could be ironed out with Moore, and even if they couldn’t, DC already had a publishing lineup that accommodated Elseworlds and Dark Knights and other “imaginary story” formats. It’s just such a loss that he didn’t do more with the Big 2 characters. And, oh yes, his Fantastic Four would have been quite something.